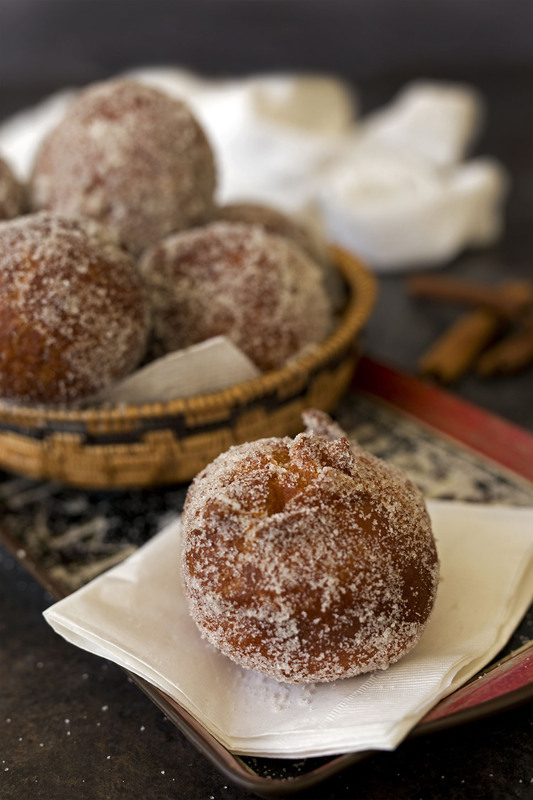 Easy, fun-to-make Hawaiian doughnuts made with a rich buttery dough, served hot from the fryer rolled in cinnamon sugar. In the bowl of a stand mixer, using the paddle attachment, combine 4 cups flour, sugar, yeast, and salt. Add evaporated milk, butter, eggs and vanilla to flour mixture. Blend at low speed until moistened. Beat 3 minutes at medium speed. Switch to the dough hook and mix in the remaining flour a little at a time, to make a soft, slightly sticky dough. Add more or less flour as needed. Place dough in lightly oiled bowl and turn to grease top. Cover; let rise in warm place until double, about 60 minutes. Punch down dough. With floured hands, pinch off a 2 ounce piece of dough and shape it into a smooth ball. Place the balls 2 inches apart on greased baking sheets or lined with parchment or a silicone mat. Loosely cover with plastic wrap and let rise until double, about 30 minutes. While doughnuts are rising, add oil to a deep fryer or large deep pot until it is 2 inches deep. Heat oil to 350°F. Carefully drop 6 malasadas in oil and fry until puffed and deep golden brown, about 8 minutes, flipping frequently. (*see note) Remove to a baking sheet lined with paper towels. Repeat with remaining malasadas. Prepare Cinnamon Sugar Coating: Add sugar and cinnamon to a mixing bowl and stir to combine. Add warm malasadas and roll in the cinnamon sugar to coat. * Cook to an internal temperature of 195°F.